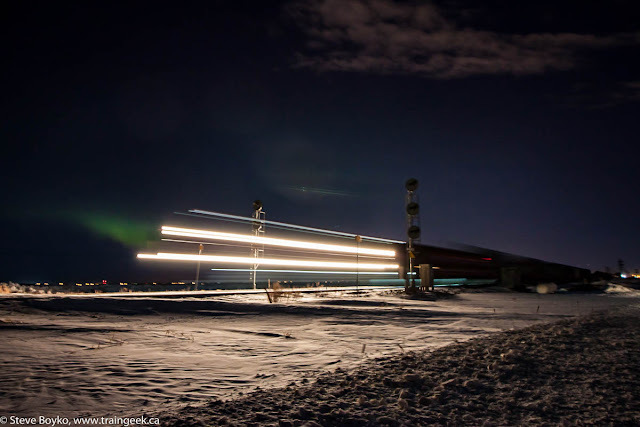 There was a railway Slide Night this past Tuesday at the University of Manitoba, organized by Mark Perry and Jeff Keddy. 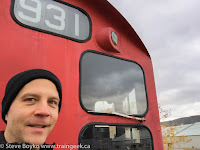 There were some great presentations by Mark, Jeff, Steve from the Winnipeg Streetcar 356 group, and Isaac R. I was super impressed by this compilation video from Jack Hykaway. This video could easily be on a DVD for sale - the narration is great, the video quality is excellent, and the editing is top notch. Give it a view... it's worth 17 minutes of your time. After that, go to Jack's YouTube channel and view the full-length videos that went into this compilation! Thanks should go to Jack for allowing me to embed this. sigh - It was inevitable, I guess. This CBC article says the $155 million overpass project has been approved, and Mayor Brian Bowman tweeted his approval of the approval. Of course, the project has its own Twitter account @WaverleyUNP - whether or not that is a joke account will be revealed eventually. We shall see if the project actually comes in on budget and on time. UPDATE: So far it's coming in under budget! 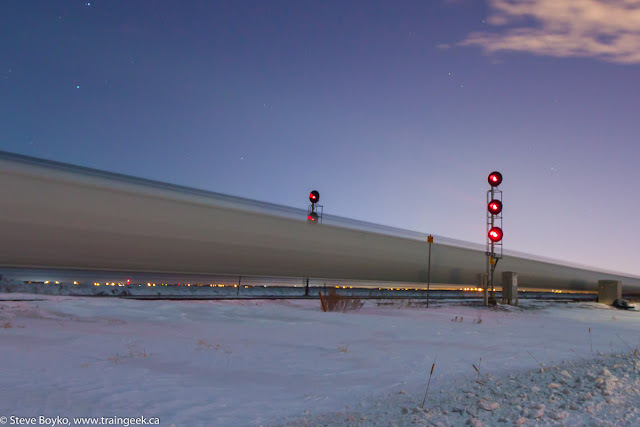 It's been a long time since I did any night train photography, but I did a bit Tuesday night. 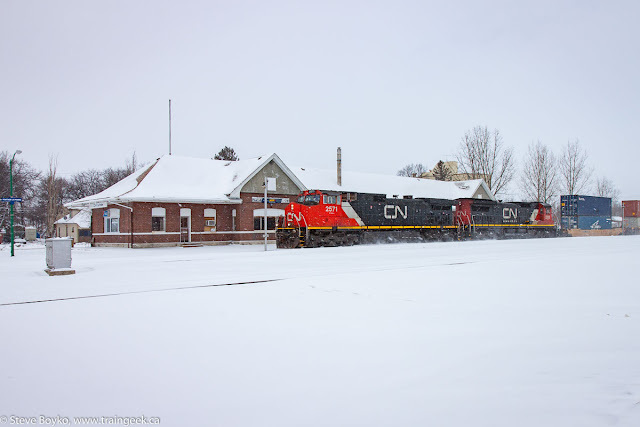 I had just delivered my daughter to Adrenaline Adventures for some night snow tubing fun, and I headed to the nearby CN Rivers subdivision to sit and wait for some trains to roll along. 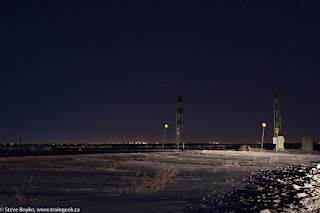 I decided to wait just west of Diamond so I could include the signals in the photographs. I set up my tripod and attached my camera to it. I used my new lens for its good light sensitivity. It took a while to get the focus set right - cameras have a hard time focusing in the dark and mine is no exception. I used my van's headlights to light up the scene a bit and that helped the focusing too. While I was waiting there, I spotted headlights to the east. I patiently waited... and waited... and waited... but the headlights didn't seem to be getting closer. I could tell they were between highway 334 and Hall Road but I couldn't figure out why a train would stop there. The other thing that was puzzling me was that the light was flickering sometimes, like it wasn't actually stopped. After a good 15-20 minutes of watching this, I sighed and decided to pack up and go see what was up. I put the tripod in the back and put my cold camera in the cold camera bag, zipped up to keep the condensation off the camera, and drove down to see what was going on. As I approached, it became clear - this wasn't a train at all. It was a "broom". 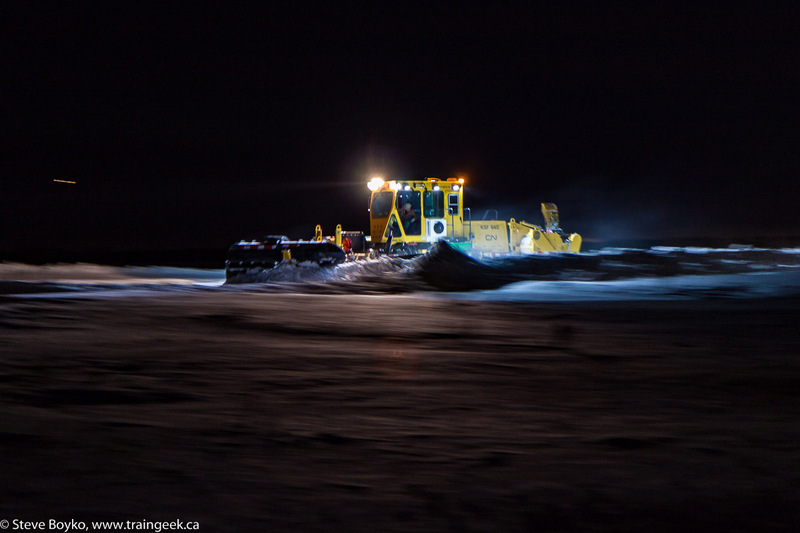 This was CN 613-12 clearing some snow drifts. The reason why it wasn't moving forward very much was because the operator was taking a number of runs at the drift to knock the snow back away from the tracks. The lights on this broom are very bright and the operator was turning most of them off when he wasn't running, which accounted for the flickering I saw. 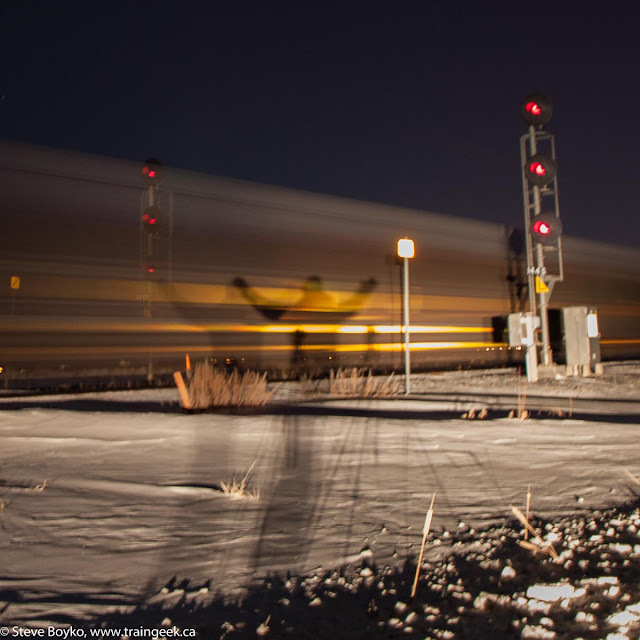 I watched him take a few runs, trying some pan shots along the way, then headed back to where I was to wait for a train. Within 10 minutes I could see a set of train headlights in the distance to the east. 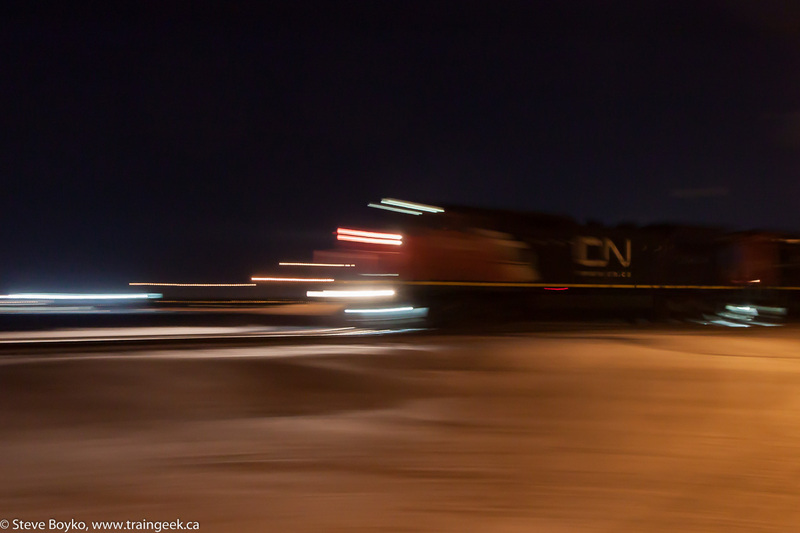 I fired off a few test shots and noticed the focus wasn't good, so I was manually focusing while the train approached. I got it locked in reasonably well before the train came into the frame, thankfully. It isn't perfect. I had the camera set for a 2 second shutter speed so I could only capture two frames with the locomotives in them. 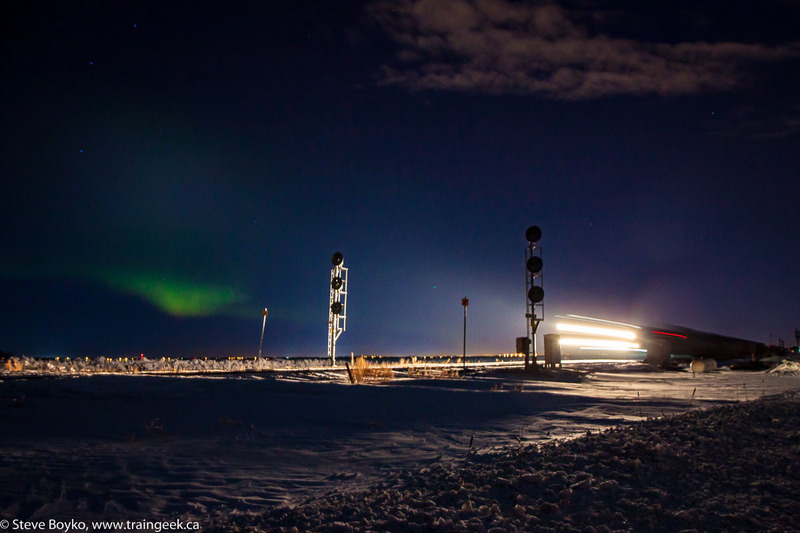 You'll notice the signals don't appear red because they only came on when the locomotives passed, so they were on for a fraction of a second during this exposure. In the photo below you'll see them fully on. Notice something else in the above two photos? I'll come back to it. After I ran to the van to scrawl the engine numbers down (IC 2726, CN 2020), I was playing with the shutter speed to see how the different speeds blurred the train. I pointed my van's headlights at the train and took a few shots. I noticed my shadow was being projected on the train, so I decided to take a shadow selfie. 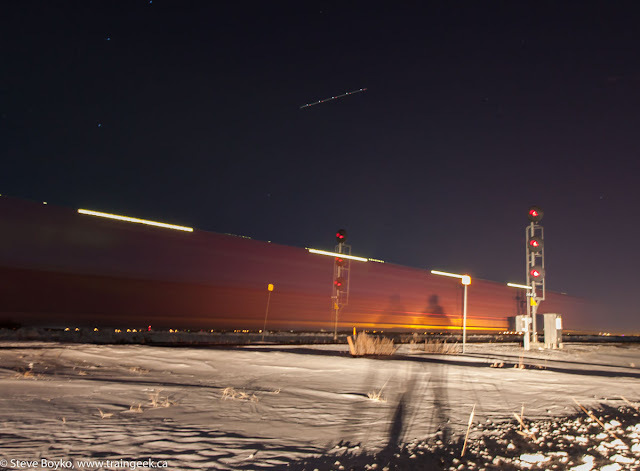 This train had a distributed braking boxcar on the end. I liked how it turned out in a long exposure photograph. Now I'll come back to something. In the two photos showing the locomotives, there was a green blob in the left of the frame. I'm pretty sure I accidentally captured some aurora borealis aka the Northern Lights. 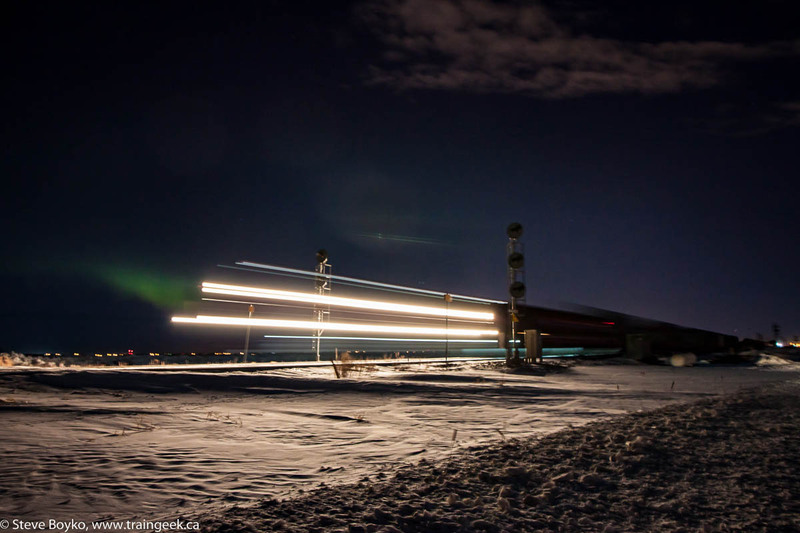 Initially I thought it was lens flare, but I reviewed a few photos I took just before the train came into view and the green is still there. 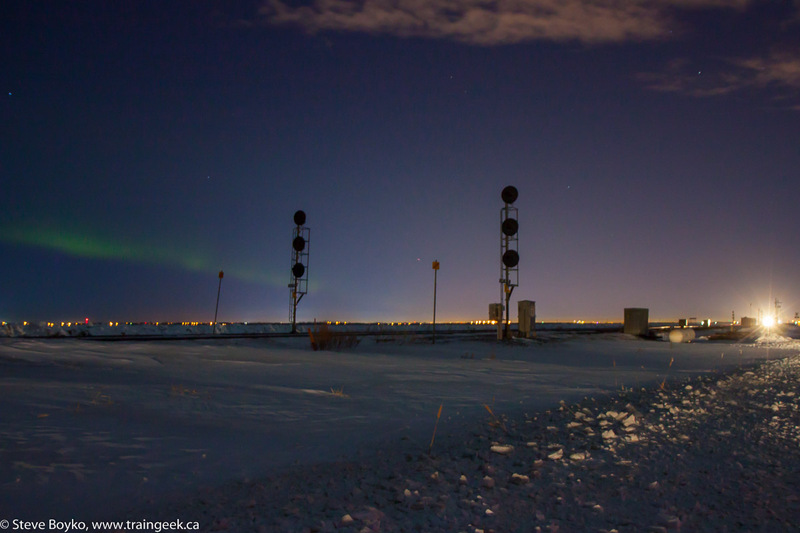 Also it changes in each photo, like the northern lights do. I picked my daughter up (she had a lot of fun) and on our way back over the tracks, I spotted another CN westbound. 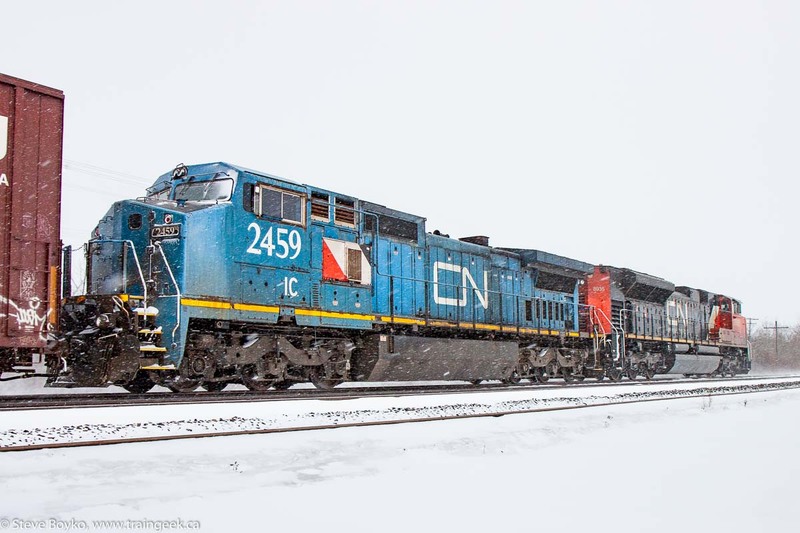 We exited the highway and I did a grab shot of CN 2182 and 2146 from the side of the road. Use a fairly wide aperture to increase your depth of field - I was using f/4.5 when my lens was capable of f/2.8 so I got a bit more DOF. 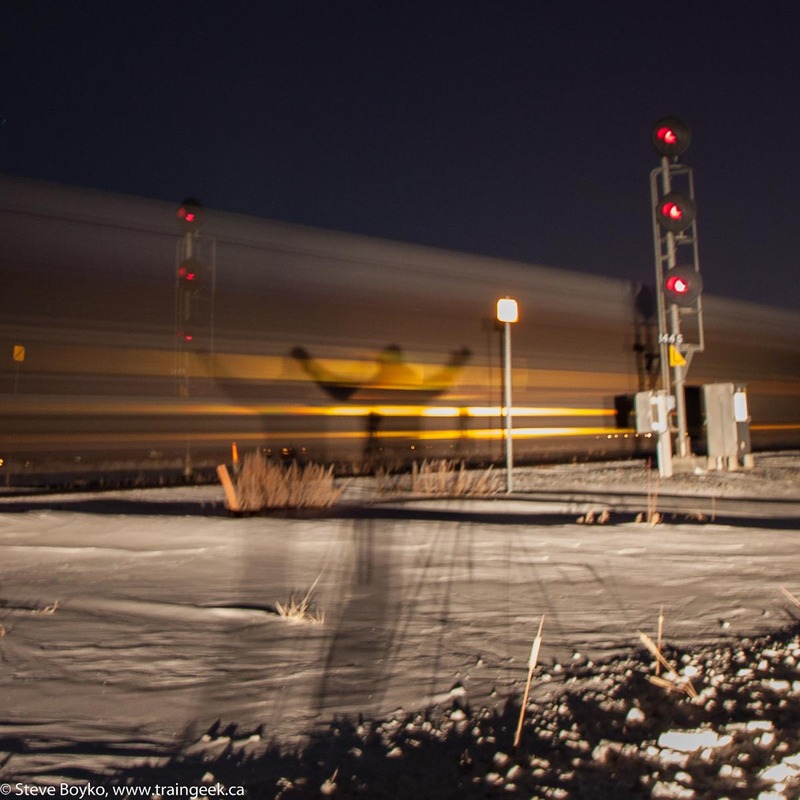 Have you done any night train photography? The meeting was chaired by Janice Lukes (my councillor, actually) and the other members of the committee are Shawn Dobson, Cindy Gilroy and Devi Sharma, all present for this meeting. After a brief presentation on gravel roads, the main issue at hand, the underpass project, was addressed. There was one presenter. Ken Klassen, a Certified Engineering Technologist (a research professional at Red River College), gave a lengthy but informative presentation on the underpass and raised a lot of questions about the project. He ran over time several times and finally Councillor Lukes decided to let him continue until he was done. Mr. Klassen said that no cost/benefit analysis has been shown. He also commented on the untendered $12.3 engineering design contract. He also pointed out that city projects constantly going over budget undermine the public's confidence in city planning. The city uses "asset management criteria" instead of a cost/benefit analysis. There is a point system involving cost versus tax benefit. 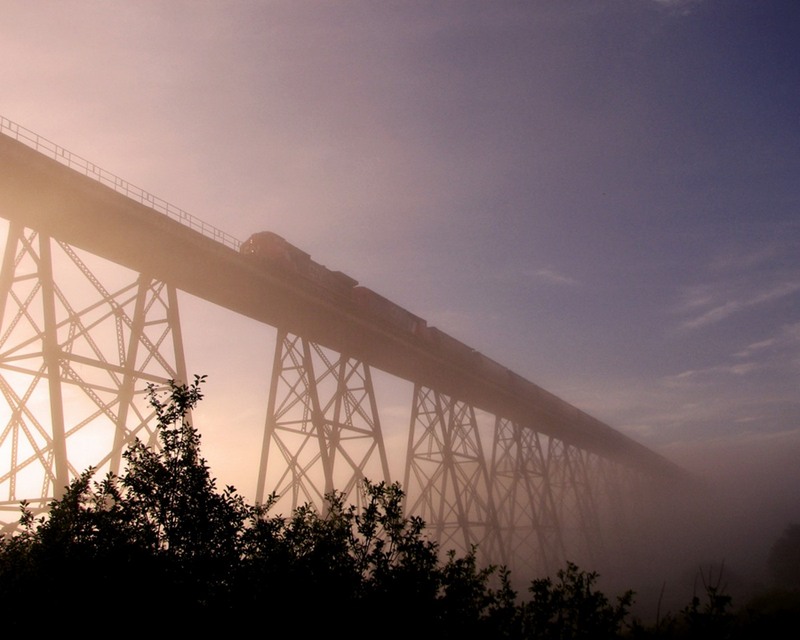 Funding is secured from provincial and federal governments for their portions. The councillors had many questions about the cost/benefit analysis - the staff's response was that it is not done and not common in city planning. Councillor Sharma asked why councillors were not being properly briefed; she argued that the March 24 2015 meeting was rushed and "not adequate". My favourite quote from her: "The process just stinks." Chair suggested councillors can speak individually to administration officials. Coun. Sharma said this is inadequate and lacks the back and forth kind of discussion that a council meeting gives, when multiple councillors are present. Councillor Dobson voiced a concern about the lack of updates from administration on major capital projects. I noted that Councillor Lukes seemed very positive toward the city administration, and seemed to me to think the project is inevitable, given that funding is in place. Finally a motion was made to forward the project to the city's Executive Policy Committee with a positive recommendation. There were two "ayes" and two "nays" - a tie - so the motion was lost. Immediately a motion was made to forward it with no recommendation. This passed. The city's Executive Policy Committee, a hand-picked subset of the full city council, passed the plan today after a presentation by Mr. Klassen and some discussion. I didn't watch this one. It goes to the full city council next week for final approval. I still believe this project costs too much for the benefits it will deliver. The city has a lot of other projects on the go and we can't afford this. I felt a little snowblind yesterday when I was out railfanning. Tom Sajnovic was in town and we decided to go railfanning on Sunday, which happened to be Valentine's Day. 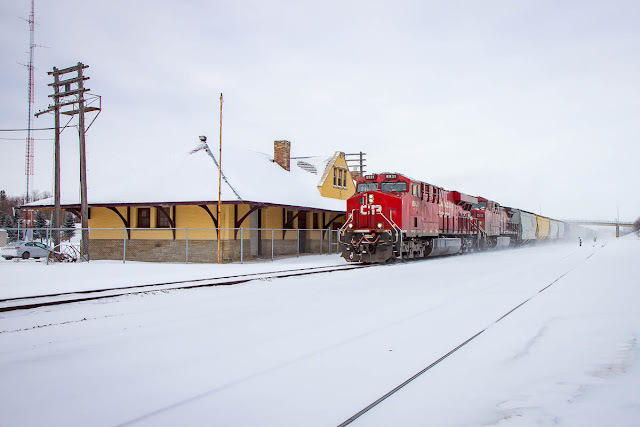 After getting the OK from my wife to spend the morning chasing trains, I picked Tom up at 8 AM and we headed over to the CP yards to start the morning. It was not a promising start. There was the usual array of active and stored units at the shops, with nothing special around except for a peek of blue from a unit in the second row that had no number boards. That might have been DME 6359 aka Mount Rushmore, reported stricken from the roster in January 2016. 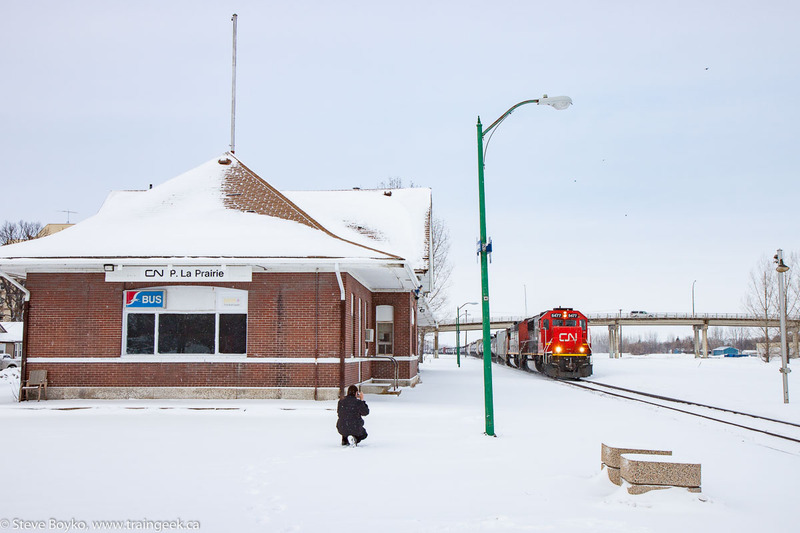 We decided to head west to Portage la Prairie and try to catch some action there. 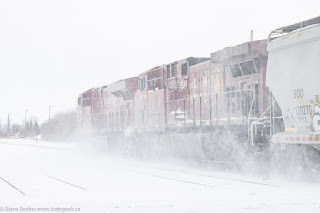 I was a bit apprehensive of the weather - relatively mild but with lots of blowing snow - but I decided to give it a try. We headed out toward Rosser with the intention of following CP to Marquette then continuing on to Portage. 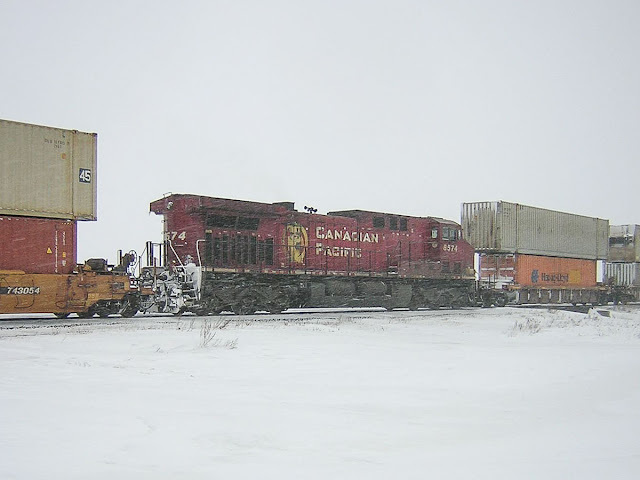 Very quickly we spotted a CP freight heading east into Makwa, just west of the Perimeter Highway. We pulled over and got the shot. 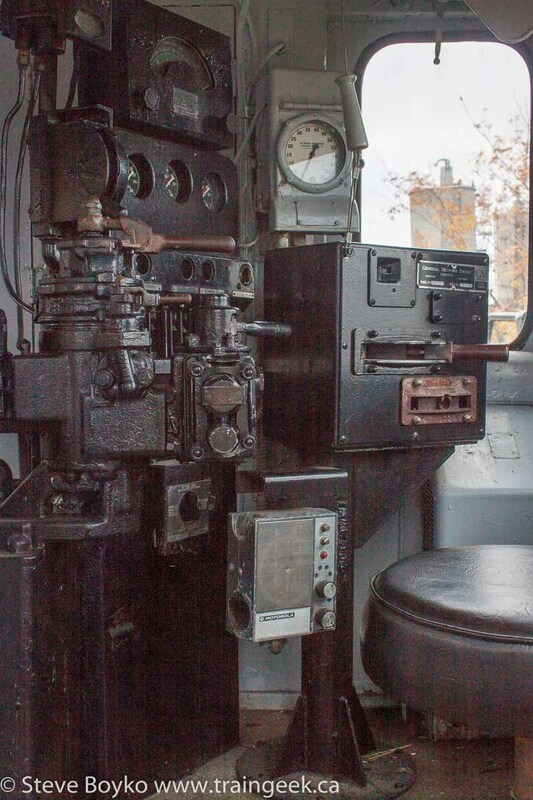 CP 9717 was the sole engine on the head end. 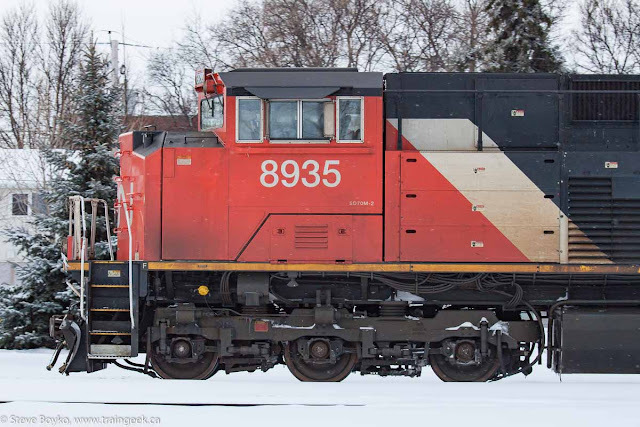 The mid train DPU was CP 8574 - photograph by Tom Sajnovic. Tom's camera batteries died when he tried to get the approach shot, but he managed to resuscitate it to grab the mid-train DPU. With that train in the bag, I decided not to continue along the CP as the highway was drifting pretty badly. We turned around and headed back to the Perimeter Highway to head to Headingley and the Trans-Canada Highway. After stopping at a gas station to get more batteries for Tom, we headed west. The highway itself was OK, with some drifting snow in the passing lane but in general it was clear. The visibility was pretty bad and I don't think we reached the speed limit at all en route to Portage. 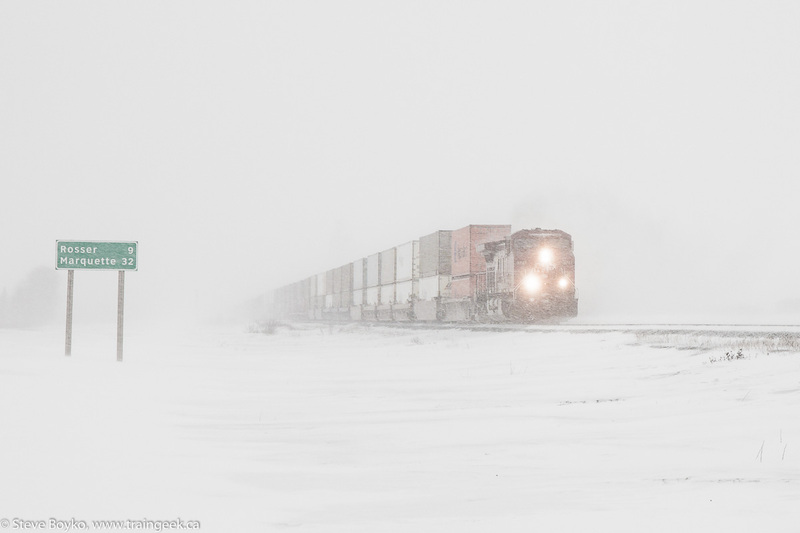 We kept an eye toward the CN line to our left but we couldn't see it most of the time, so if trains were passing, we didn't see them. The weather cleared up a bit as we approached Portage. We arrived in Portage la Prairie and headed to the area between the CN and CP tracks, just east of the stations and the Tupper Street overpass. 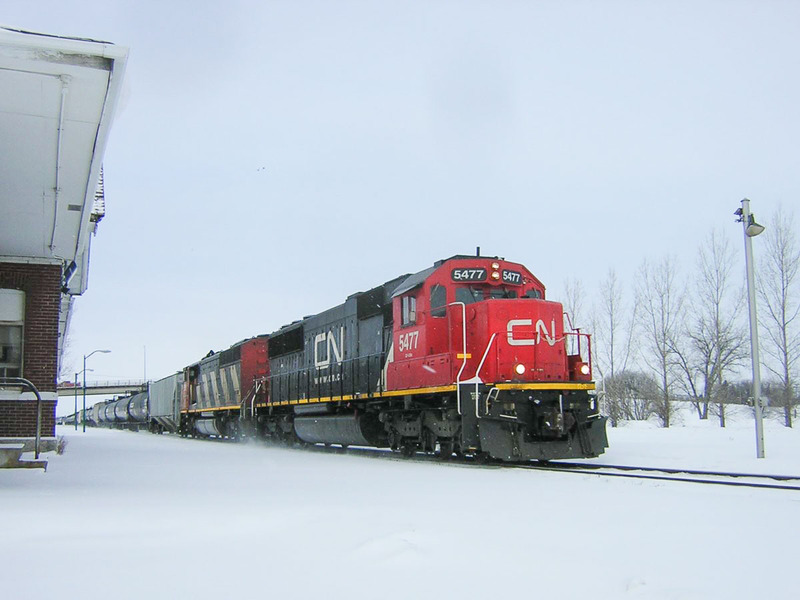 Shortly thereafter, a CN eastbound rolled into view, with CN 2571 and CN 2008. The train had a few of these blue NOKL Dynastack cars on them, a car I haven't seen before. The blue really stands out. After that train passed, Tom needed to go to Shoppers Drug Mart to pick something up, so we headed over and parked in front of the store. As we were getting out of the car, Tom heard a horn... so we hopped back in and drove over the Tupper St. overpass, spotting an eastbound CN train to the west, and went to the VIA station to capture CN 5477 East. ... and here's Tom's viewpoint. I was a little behind Tom and a bit closer to the tracks. Here's my view. I think I like his viewpoint better! 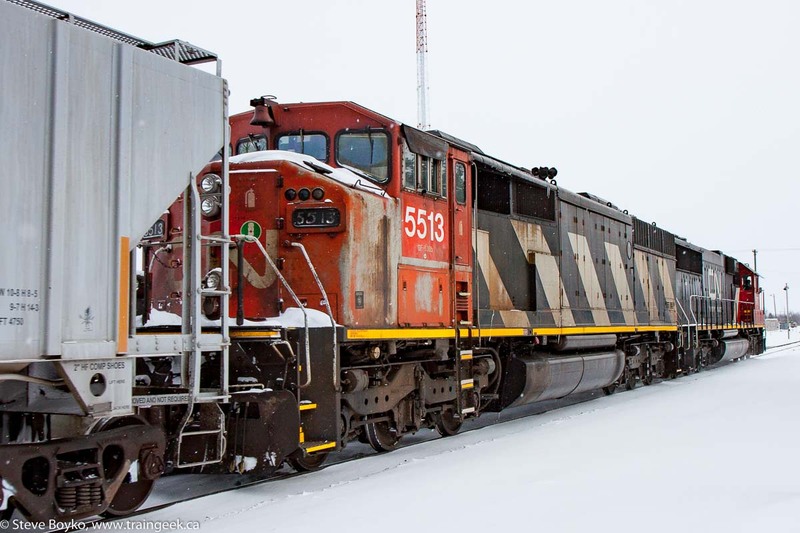 Poor tired CN 5513 was the trailing unit on the train. I was surprised to find out this was the first time I'd photographed 5513. I thought I'd probably grabbed all of the extant SD60Fs but I guess not! 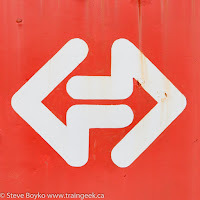 After we gave that train the roll-by inspection, we headed back to Shoppers Drug Mart again. We parked in front of the store, got out... and both of us heard a horn this time. Back in the car... back to the tracks, for the third CN eastbound train in a row, CN 8935 East with a blue IC unit trailing. This train had mixed freight on the head end, with containers on the rear. Maybe it was CN 198? 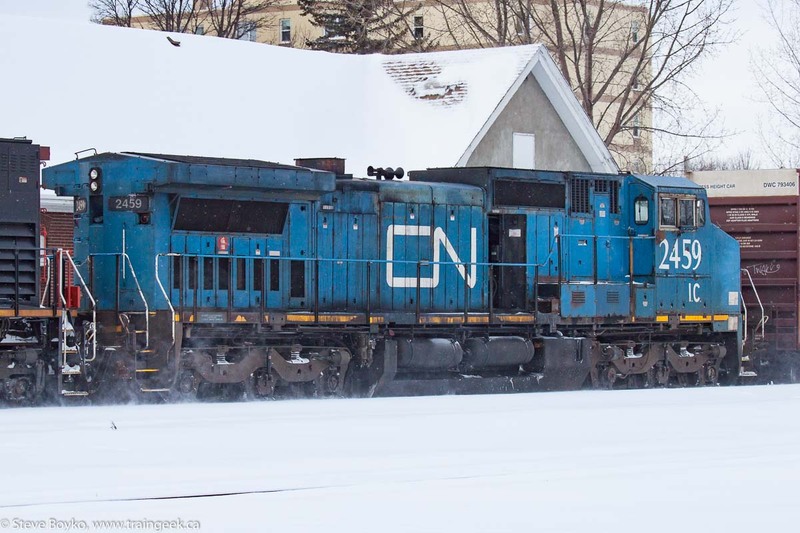 In any case, it had one of CN's distributed braking containers, CNSU0007, in the middle of the freight cars. After that train passed, we headed back to Shoppers for the third time and parked. 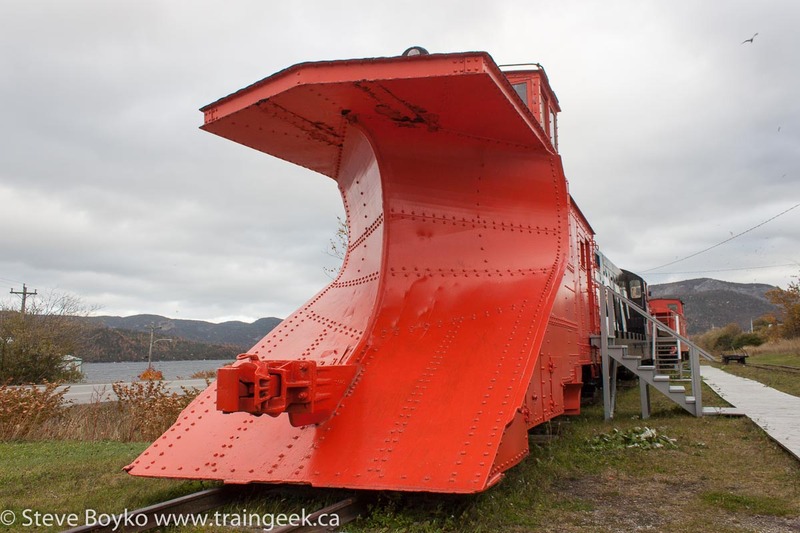 This time someone was blowing snow off the sidewalks with a leaf blower, so there was no way we were going to hear any train horns! 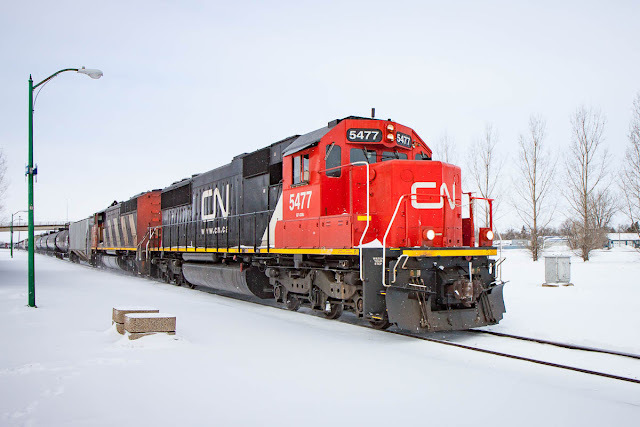 Tom bought what he needed, and as we drove back to the tracks we saw a fourth CN eastbound train rolling by. I didn't know it was parade day on CN! After the containers finished rolling by, we went over the Tupper Street overpass and noted a green signal on CP indicating a CP eastbound was coming. We parked by the Canadian Pacific Railway Heritage Park and Interpretive Centre aka the old CP station. Here's my view. Railpictures.NET liked this one. 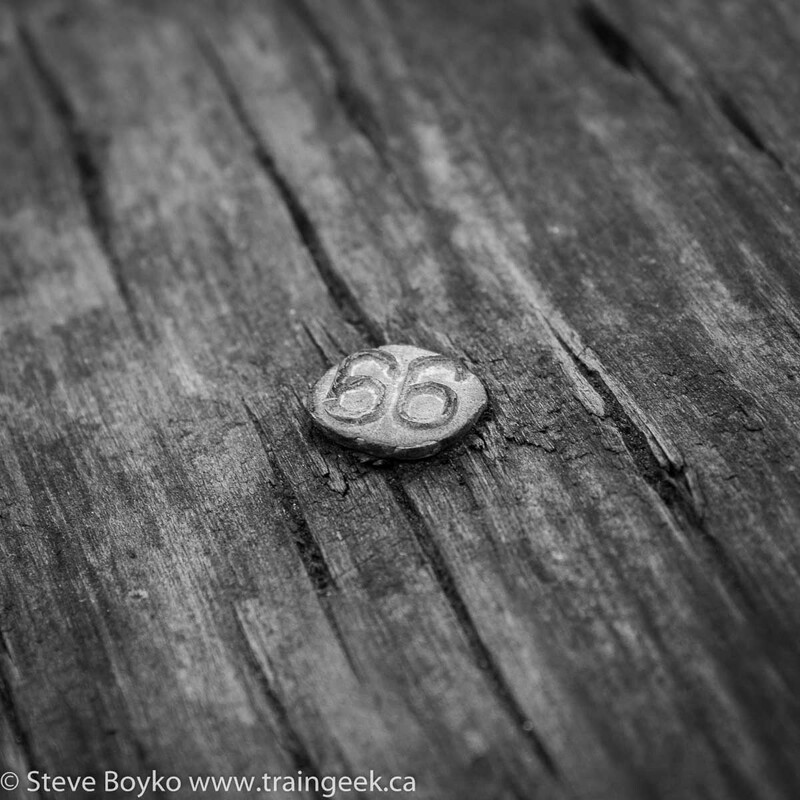 It was time for me to go home, so we headed back along the Trans-Canada Highway. 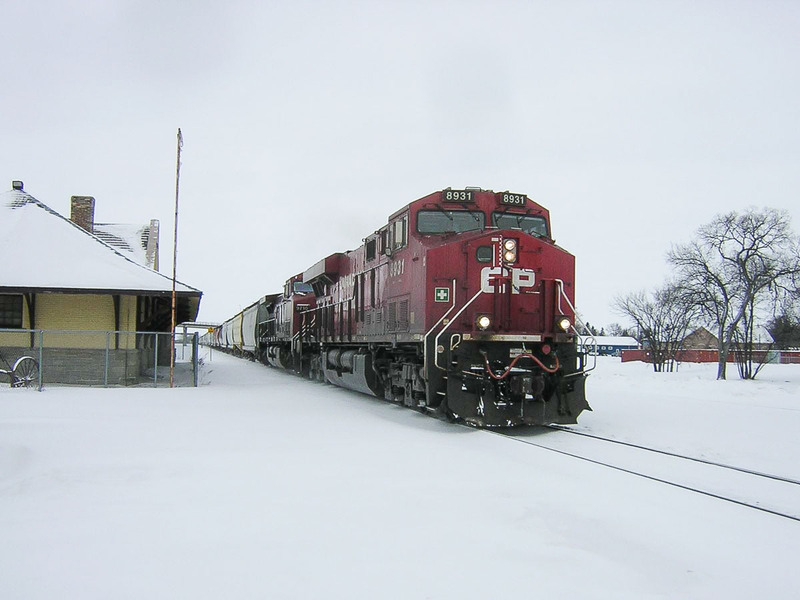 There was a westbound CP intermodal over at Tupper by the Viterra elevator but we had no time to catch it. We ducked into Oakville but there was no action there, so we came back out and proceeded into Winnipeg. On the way we saw the intermodal train we missed, dimly and in the distance. I elected to come in along Wilkes and we spotted CN 8935 East again with the IC unit trailing. I overtook it before Shaftesbury and we bailed out to capture the other side of the train. I'm quite happy with this photo, showing IC 2459 with a little bit of CN red. That was our day of railfanning between Winnipeg and Portage la Prairie. Thanks to Tom for inspiring me to get out and shoot some trains! 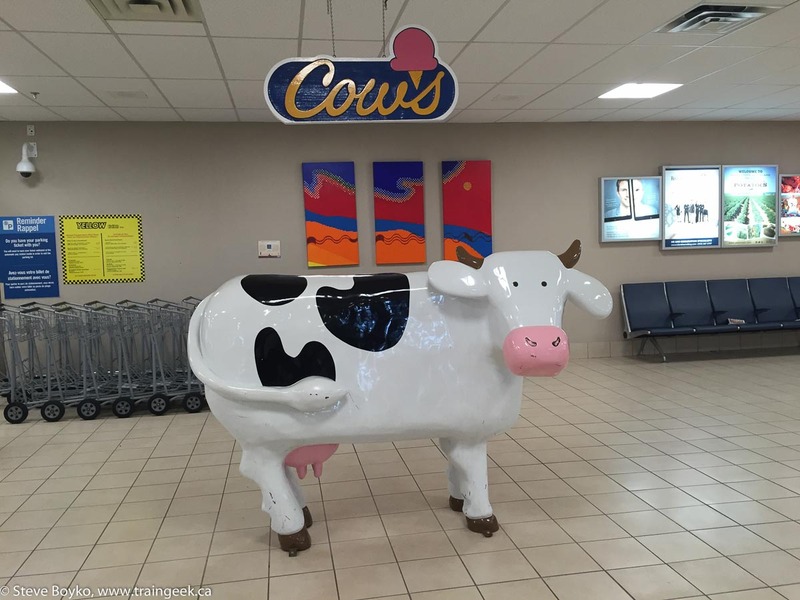 Back in October 2015 I went to Summerside, PEI for work for four days. I didn't have much time for non-work activities, but I did manage to see a precious few train-related items. Most people know that there are no* railway tracks on Prince Edward Island since CN ceased operations and the last train left on December 28, 1989. * well, none of any appreciable length. 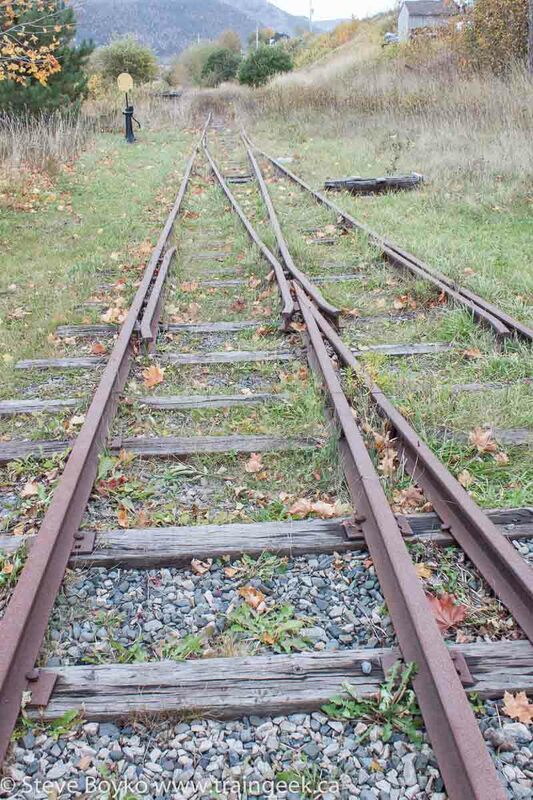 There is some track at the Elmira Railway Museum and maybe a few lengths here and there throughout the Island. 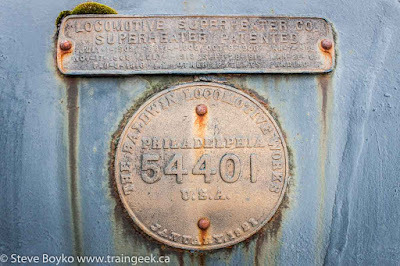 There are still a few railway items around on the Island. There are several train stations on the island, some in private hands and some in public hands. 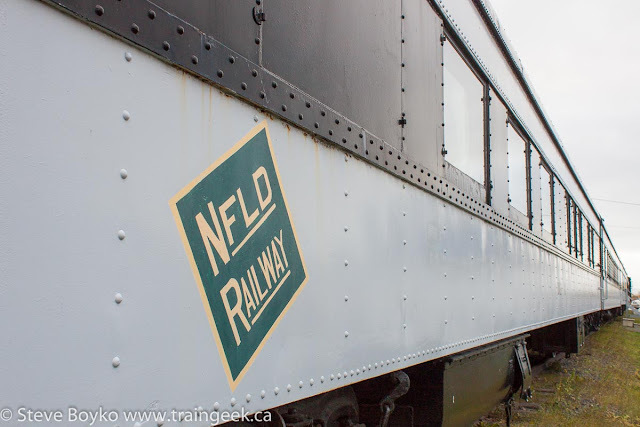 In Summerside itself, the former CN station is the town library and is handsomely decorated with murals. I walked over to it late one evening after getting my Greco donair fix. 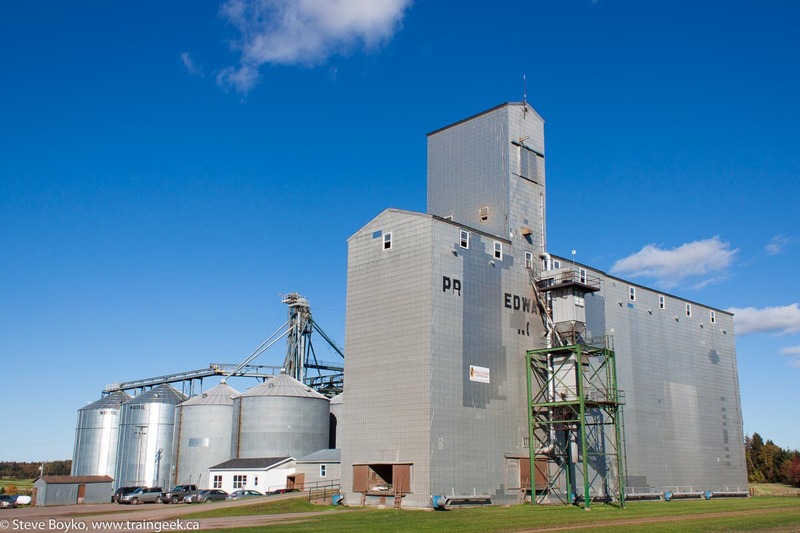 Prince Edward Island had a few grain elevators, and three are still owned by the provincially-owned PEI Grain Elevators Corporation. 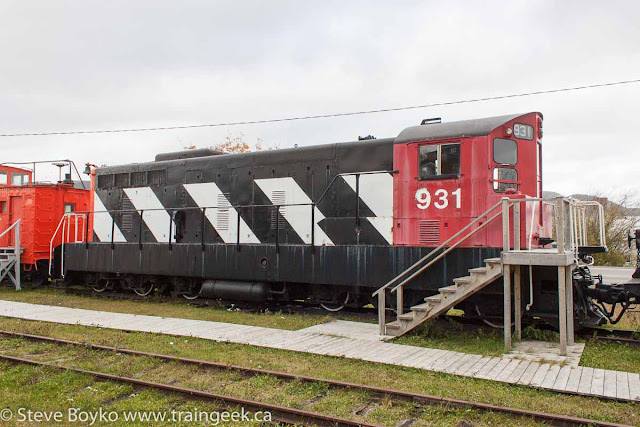 The largest is located outside Kensington next to the former CN right-of-way. An elevator like this would not be out of place on the Prairies! It was built in 1971 and is of wood construction, unlike the other two elevators at Roseneath and Elmsdale. 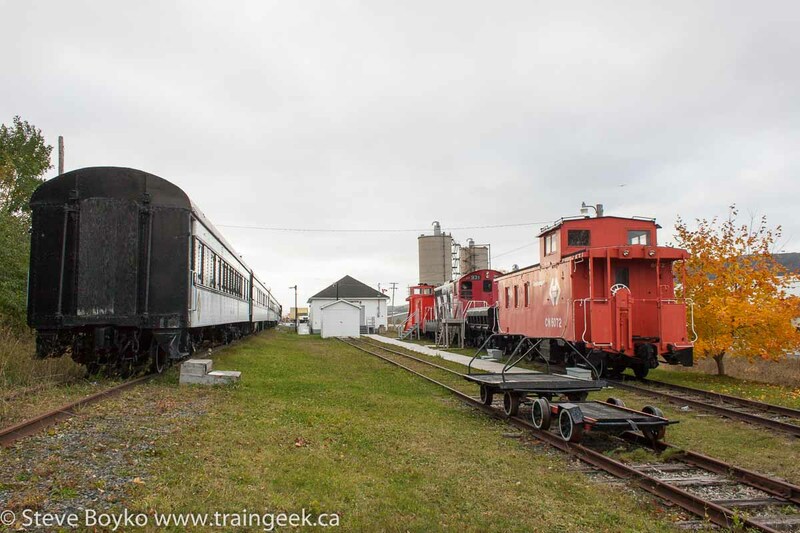 Speaking of Kensington, this town houses two important railway artefacts - the only locomotive on the island, CN 1762, and the beautiful Kensington railway station. 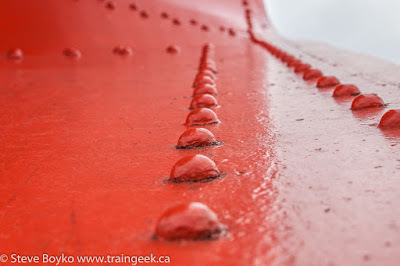 I photographed them (and the above grain elevator) en route to the airport in Charlottetown. Fortunately it was a lovely day for photographs. 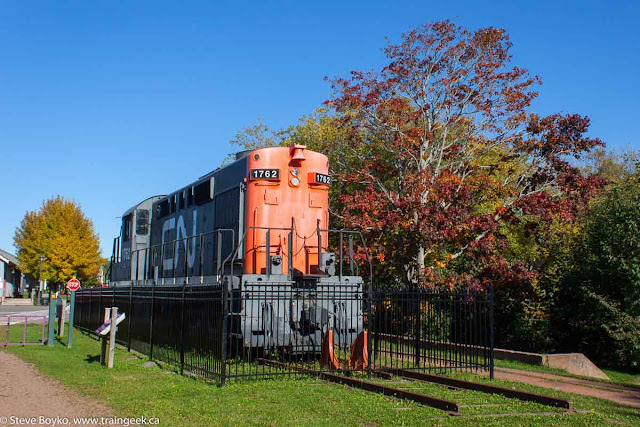 CN 1762 is an RSC-14 locomotive that would not have been out of place on the Island. I'm not sure how much it operated on the island, if at all, but it ended up here. 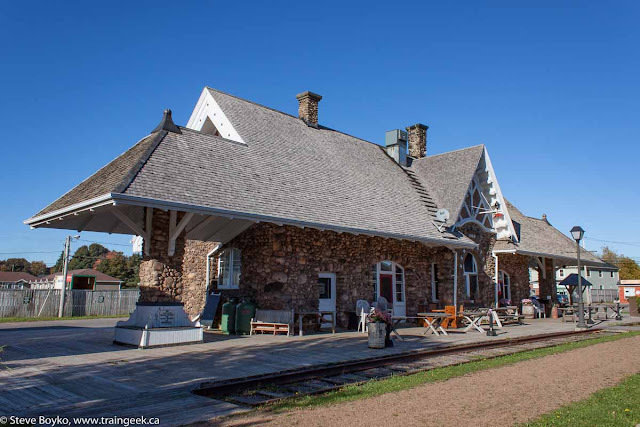 The Kensington train station is fairly unique with its New Brunswick fieldstone construction. It is a National Historic Site and currently hosts the Island Stone Pub. That was all I had time to visit on that trip. I was pleased to be able to meet up with the talented Taylor Main and Chris Mears of the great Prince Street Terminal blog. My previous visit to Kensington. 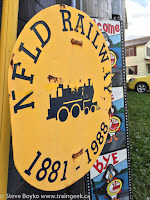 Just a quick note to let you know that I've created a model train store directory over at Modeltraingeek.com. 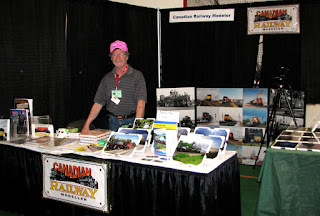 I had noticed there wasn't any good listing of all the Canadian model train stores. Both the NMRA and the CAORM had pages with Canadian stores, but they were incomplete and out of date, with many linked sites no longer existing. 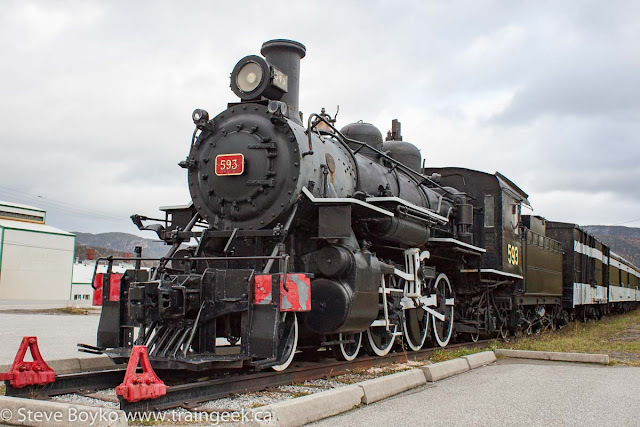 This past Sunday, I went through both lists, as well as the list of stores in Canadian Railway Modeller, weeded out the sites that were no longer responding, and came up with an initial list. I then added sites that came up in Google and called it rev 0 and posted it in the excellent Canadian Railway Modellers Facebook group. I received some additions to the list and a few deletions too, so I've incorporated all of their great suggestions and I believe the list is more or less complete now. I will do my best to maintain it and I welcome any corrections, additions or sad notices of store closures. I should point out that I'm only listing physical stores that people can visit. 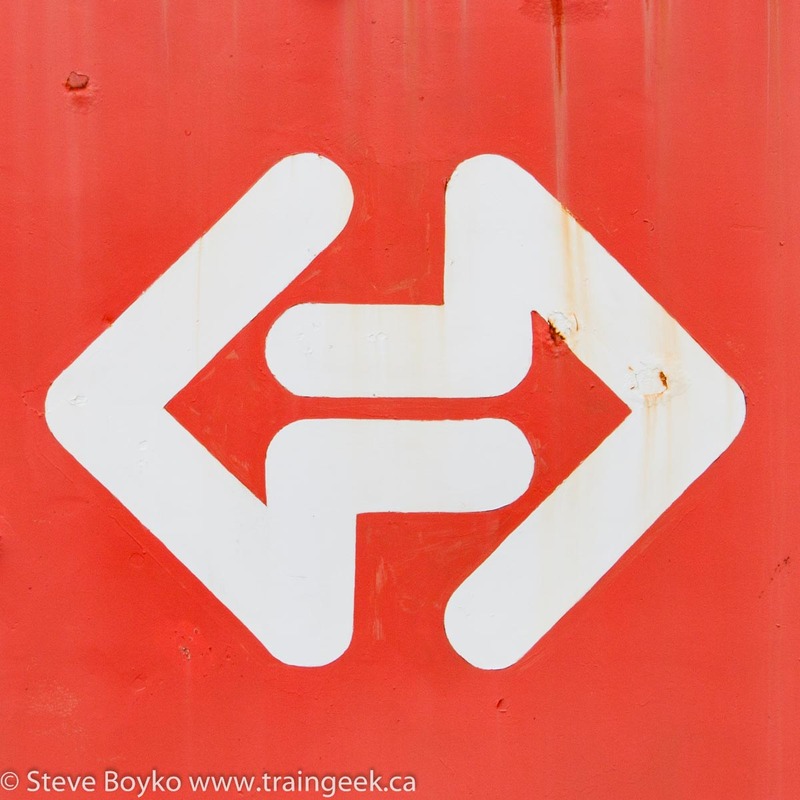 Virtual stores like Canadian Express Line are not listed. I want to encourage people to visit their local hobby store, and I want to have a listing of local stores so when people are visiting someplace new, they can find a hobby store. Already people have commented about stores that they never knew existed near them. See the Canadian model train store directory! Don't have a local model train store? 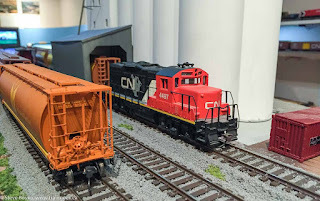 Look for model trains on Amazon.